So which stocks look set to benefit from this golden era? Here we use TipRanks’ stock screener to pinpoint five top energy stocks with big exposure to rising oil prices. All these stocks share a very bullish ‘Strong Buy’ analyst consensus rating. This is based only on ratings from the last three months. Exploration and production company Pioneer Natural Resources (NYSE:PXD) is fast becoming a pure-play on the Permian Basin. In the Permian Basin alone, Pioneer’s acreage could contain 20,000 drilling locations and a whopping 11 BBOE (billion barrels of oil equivalent). And by divesting assets outside the Permian Basin (including Eagleford, Raton (CO), South Texas, and West Panhandle (TX), Pioneer is set to rake in $600-$900 million. And the best part for shareholders is that this excess free cash flow can fund strong stock buybacks and higher dividend payouts. Overall, this ‘Strong Buy’ stock has received eight buy ratings in the last three months. In this same time period, only one analyst has stayed sidelined. In the last month shares are up 19% and looking forward, analysts are predicting (on average) further upside potential of 21% to $235. Most encouragingly, top Goldman Sachs analyst Brian Singer has just added Pioneer to his exclusive ‘Conviction Buy’ stock list. The move comes with a newly-hiked price target of $231. Indeed, turning to our data, we can see that Williams Capital analyst Gabriele Sorbara has just reiterated his Newfield buy rating following ‘great’ Q1 results. “After the market close yesterday, NFX reported great 1Q18 results with a beat across production, EPS and DCFPS [discretionary cash flow per share]” writes Sorbara. He has a $39 price target on the stock. And looking forward, Newfield has now boosted its production guidance by 1.9% to 178.0-190 Mboe/d. In the last three months, only two analysts out of 12 have stayed on the sidelines. The $36 average analyst price target works out at 25% upside from the current share price. On the bullish end, Piper Jaffray’s David Kistler is forecasting over 55% upside potential for this ‘Strong Buy’ stock. 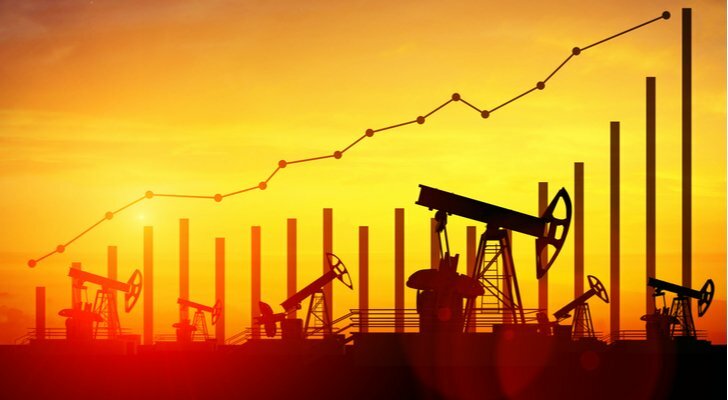 Article printed from InvestorPlace Media, https://investorplace.com/2018/05/5-top-energy-stocks-for-100-barrel-oil/.